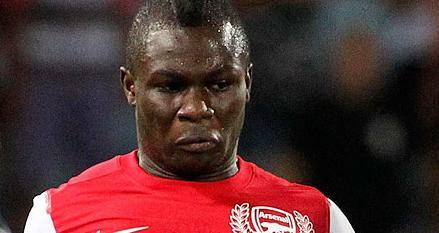 BlackwaterBLUE from monkster.com: Shock offer for Arsenal's ting-tong Frimpong? Shock offer for Arsenal's ting-tong Frimpong? Arsenal midfielder Emmanuel Frimpong has emerged as a shock target for Chelsea as the Blues continue to compile a shortlist of potential signings. Chelsea have endured their worst start to a Premier League season since Roman Abramovich took over and the pressure is building on Andre Villas-Boas, despite only arriving in the summer. There has been an emphasis placed on bringing in youngsters at Stamford Bridge with Oriel Romeu, Romelu Lukaku and Thibaut Courtois all arriving. And according to latest rumours, Villas-Boas has been impressed with Arsenal youngster Frimpong and is ready to offer £10m for his services in January. The 19-year-old midfielder is showing great promise, however it is thought Arsene Wenger is growing frustrated at his attitude having seen the teenager pick up a red card earlier in the season followed by his controversial spat with former teammate Sami Nasri in the tunnel after Tuesday's Carling Cup defeat to Manchester City.